Saturday, September 9, 2017, Olde Riverside will once again welcome cars and motorcycles to our business district. 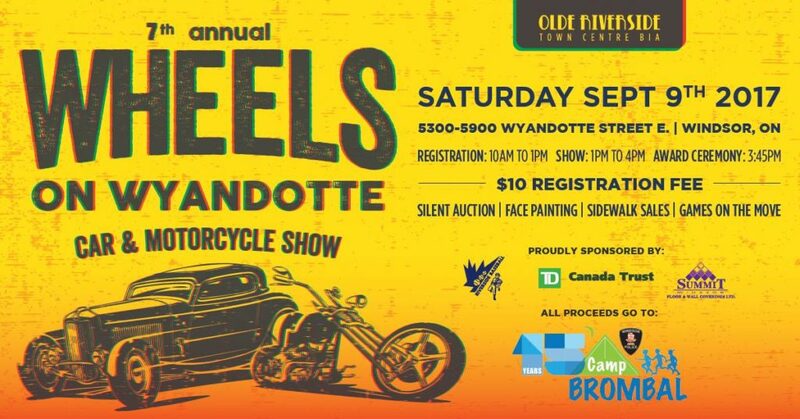 Wyandotte Street will be closed for the event from 8:00 a.m. to 4:00 p.m. Car registration will take place starting at 10:00 a.m. with the show running from 1:00 p.m. to 4:00 p.m. $10.00 entry fee for show vehicles, and free to the public. Cash Awards and plaques are given for the top three cars and top three motorcycles as selected by those visiting the show. This is a family friendly event with activities for everyone. This year we will be featuring Games on the Move, Rock Climbing wall and activities for the kids. A good opportunity to see the hospitality of our business district and view classic to antique cars and motorcycles. A silent auction will feature a Windsor Spitfire Suite (2017 Memorial Cup Champions) for one game valued at $1,000, Seattle Seahawks Luke Wilson autographed and framed jersey, $400 in Gas Cards, two adult bikes and many more items to be added. While visiting our car show, you will be able to take a free Trolley to our neighbouring business district, Pillette Village for Vintage in the Village, an antiques and collectible outdoor fair, occurring at the same time. Money raised from this event is donated to Windsor Police Services Camp Brombal for Kids. This camp allows kids who would not ordinarily be able to go to camp, an opportunity to have some fun in the summer. They are given a free bike, school supplies and a wonderful and fun filled week at Camp. Olde Riverside Town Centre is proud to be a supporter of Camp Brombal.